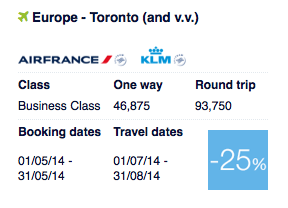 The latest set of Air France KLM Flying Blue Promo Awards are out and this time there are two Canadian cities included. The past few Promo Awards have not seen any of our cities included so this is a nice change! The latest set of offers will be bookable as of May 1st and are good for award travel over the summer in July and August! 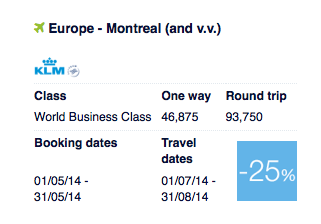 The offers this time are for 25% off Business Class between Toronto or Montreal and Europe. This could end up being a great deal considering this is for award travel during peak season when other airlines will be typically charging higher amounts of miles if they have the availability. Don't have the miles? You could always consider transferring Starpoints earned via the Starwood Preferred Guest Credit Card from American Express to Flying Blue. What are the promo awards? 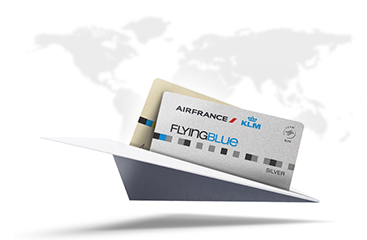 The promo awards are a discount of 25-50% off the regular Flying Blue mileage requirement for select AF KLM flights in select cabins. Due to increases in the regular award mileage requirements last year the promo awards not as grand as they used to be but overall are they are still considered a great deal when compared to the regular mileage requirements. With the 25% this time the rates are still slight higher than Aeroplan's 90,000 miles for a ClassicFlight Business Class ticket to Europe. To take advantage of this deal you must book your promo award ticket between May 1 and May 31 for travel between July 1 and August 21. More details can be found here.